The 46.24 metre motor yacht Just J’s, listed for sale by Merle Wood & Associates, has been sold with Alex Rogers at Westport Yacht Sales acting for the buyer. With exterior and interior design by Jonathan Quinn Barnett, she was built in GRP by Seattle based yard Delta Marine to ABS class and delivered in 2011. She features a balance of elegance and strength, form and function, performance, range and comfort. 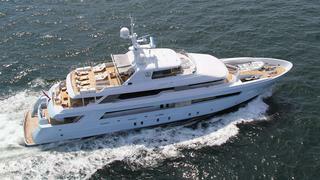 The yacht has a flared hull design with a hard chine to deflect spray and a high sheer. MCA compliant, her interior by Geoffrey Bradfield offers luxurious accommodation for ten guests in an elegant two toned interior consists of five cabins including a large full beam master suite on the main deck, two doubles with king sized beds, a further double with a queen sized bed and a twin, and all have full en suite facilities. Impressive outdoor deck spaces provide a well balanced mix of sheltered and open areas, expansive settings and secluded corners, which are suitable for relaxation, entertaining or dining as well as other social occasions. Outdoor features include a fantastic sun deck complete with several sun loungers, a day head, bar and spa pool, a large skylounge and aft decks ideal for dining al fresco. Just J's is wheelchair accessible, with extra wide doors, spacious walkways and a centrally located elevator providing convenient access to all four decks from the guest area to the sun deck. Twin 2,250hp Caterpillar engines give her a cruising speed of 16 knots, a range of 3,000 nautical miles at 12 knots and she is fitted with zero speed stabilisers. Just J’s was asking $24.9 million.